Before you go to bed make the sponge. Mix water, flour and starter in a bowl. Cover and leave in a fairly warm place overnight. The next morning to knead the dough by hand: mix the flour and salt into the sponge. Bring it together, the dough should be soft and sticky. When you start kneading you'll see how it's changing. First your dough will be very soft and wet, then it will start to harden and becoming very tough. You won't be able to stretch it at this stage, if you try to stretch it it will just break. Keep kneading! You'll start noticing that your dough is becoming more elastic, when you try to stretch it, it will behave like a silicone/rubber. You'll be able to stretch it to a very fine, almost see through, piece of dough. When your dough is smooth and satin, shape it into a nice tight round (by lifting the edges and and folding them into the middle). Put it back into the bowl, cover and leave somewhere warm for it to rise (double it's size). 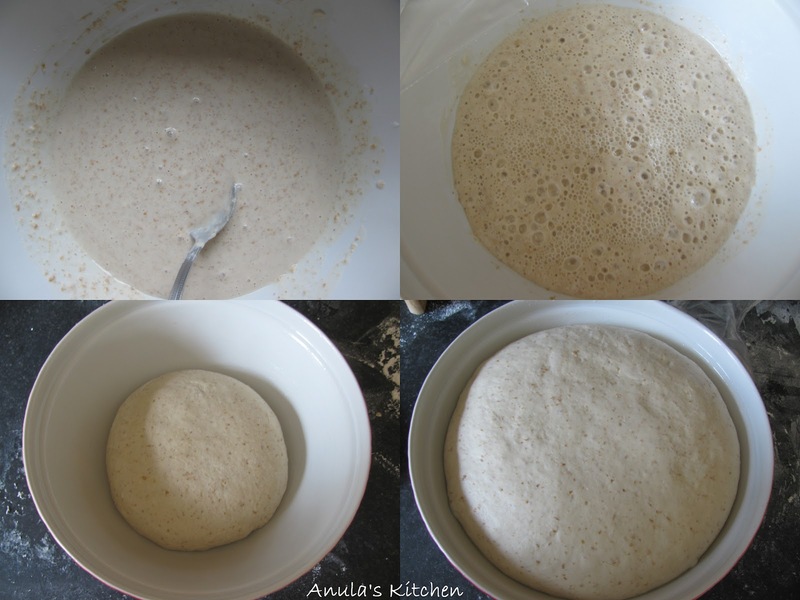 When your dough is well risen, take it out of the bowl, deflate and shape your rolls/loaf. Place it on your baking tray and leave again for final rising. Preheat your oven to 220 C. Place an oven prof dish filled with water on the bottom of your oven. You need to create lots of steam in your oven (like sauna). It will help your rolls/bread to rise and will create a nice crust. Just before putting your rolls into the oven cut them with a very sharp knife and sprinkle with some water. When putting into the oven try to loose as little steam from inside as possible. For the first 10 minutes bake in the 220 C then turn the temperature down to 180 C and bake for further 10 minutes (for loaf bake for further 40 minutes). The times are only roughly here. You have to keep an eye on it, so it won't burn. When taken out from the oven your rolls/bread should sound 'hollow' when taped at the bottom.